There is no more existance of gray matter area which is homologous to anterior horn. Gray matter of posterior horn presenting nucleus gracilis, nucleus cuneatus and spinal nucleus of trigmenial nerve gets detached from central gray matter. This detachment is because of the arched fibers arising from nucleus gracilis and nucleus cuneatus which decussate ventrally to form ascending fiber tract which is called medial lemniscus. Central canal surrounded by central gray matter is pushed more dorsally. Central gray matter presents appearance of cranial nerve nuclei. It is the plane of medulla oblongata from where upward typical relationship of central gray matter and peripheral white matter of spinal cord is lost. It results intermingling of gray and white matters. On either side of ventral median fissure bulge of pyramid presents sections through descending (efferent) fibers of pyramidal (corticospinal) tract. Lateral to fibers of pyramid, inferior olivary nucleus starts appearing. It looks like a small irregularwalled sac whose cavity opens backwards and medially. Inferior olivary nucleus is the most prominent part of olivary nuclear complex of human brain. Rudimentary components are dorsal and medial olivary nuclei which together are known as accessory olivary nuclei. 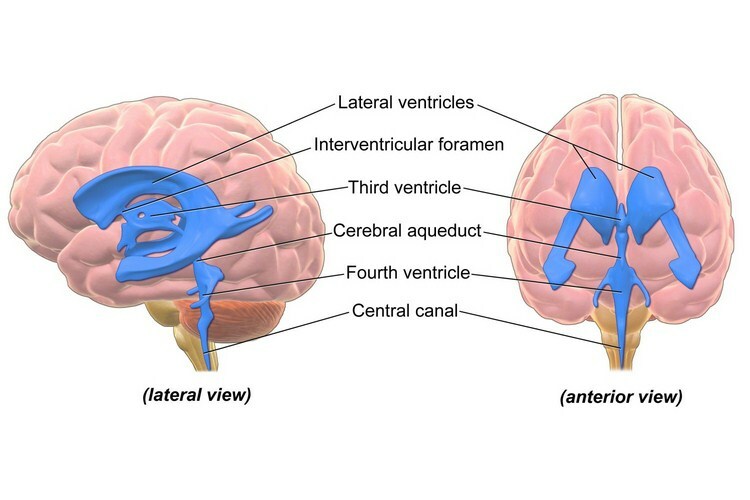 Ascending (afferent) tracts, e.g. dorsal and ventral spinocerebellar tracts, lateral and anterior spinothalamic tracts are found to be in corresponding positions as noticed in previous section of medulla oblongata. Nucleus gracilis and nucleus cuneatus are seen to be more prominent in this section. These nuclei receive fibers from fasciculus gracilis and fasciculus cuneatus which carry conscious proprioceptive sensation and sense of tactile discrimination from lower and upper halves of body respectively. Dorsolateral to nucleus cuneatus, a smaller accessory cuneate nucleus is seen. It receives fibers of fasciculus cuneatus which carry same sensations from uppermost part (head-end) of body. Cuneocerebellar tract from this nucleus end in cerebellum as spinocerebellar pathway above T1 spinal cord segment. Central core of the section presents scattered nerve cells and reticulum (network) of fibers to form brainstem reticular formation. Posterior gray horn separated from central gray matter is represented by spinal nucleus of trigeminal nerve which is capped on the surface by fibers of sensory root of trigeminal nerve carrying pain and temperature sensation, called spinal tract of trigeminal nerve. Nucleus gracilis and nucleus cuneatus are the medial and lateral mass of gray matter on either side of posterior median septum. These are also the components of posterior gray horn which are detached from central gray matter. Reason for separation of spinal nucleus of trigeminal nerve, nucleus gracilis and nucleus cuneatus from central gray matter is due to followingcharacteristic of structure of medulla oblongata at this level. Fasciculus gracilis and fasciculus cuneatus are the two ascending tracts of posterior column of spinal cord which carry sense of conscious proprioception and tactile discrimination from lower and upper halves of body respectively. Reaching the medulla oblongata upto this level, fibers of these two tracts relay in corresponding nuclei lying ventrally. Processes of next order of neurons in nucleus gracilis and nucleus cuneatus, before ascending further upwards to relay in thalamus, decussate to cross the midline. During decussation, these fibers presents following three characteristics. Fibers of both nucleus gracilis and nucleus cuneatus pass forwards arching along the lateral aspect of central gray matter horizontally in a curved fashion that is why they are called internal arcuate fibers. After decussation, the fibers form a compact bundle just behind the bulge of pyramid, before this compact bundle of fibers ascend upwards to reach thalamus. This bundle is known as medial lemniscus (Plural – Lemnisci). During formation of medial lemnisci, fibers from nucleus gracilis (carrying sensations from lower half of body) are positioned anterior to the fibers from nucleus cuneatus (carrying sensation from upper half of body). Behind medial lemniscus, pass tectospinal tract medial longitudinal fasciculus. Central gray matter: It encircles the central canal of medulla oblongata which is pushed more posteriorly. It presents following cranial nerve nuclei which are interrelated ventrolaterally. Hypoglossal nerve nucleus (XII): It is the nucleus of somatic efferent column, lying ventral to central canal of medulla oblongata.